Best Android 6.0 Marshmallow Features. The latest OS of Android (Android Marshmallow) is in the news. It is the best so far. The previous Android OS version, Lollipop is said to run on ~20% of all Android devices. Few days back, there was a piece of news on the Marshmallow update that was said to be rolling out on October 5th. Android Lollipop has changed the way Android OS used to look, not only the material design approach, but there have been a lot of internal changes like, new APIs and many unlocked APIs which make development of Android apps easier. Android 6.0 Marshmallow is basically a revamped version of the Android Lollipop. As we all know, being the most different update, the Android Lollipop came with a lot of bugs and solving one by one with updates was done by Google. Android 6.0 is not much different from the Android Lollipop OS, but is a bit improved version of the Lollipop OS. 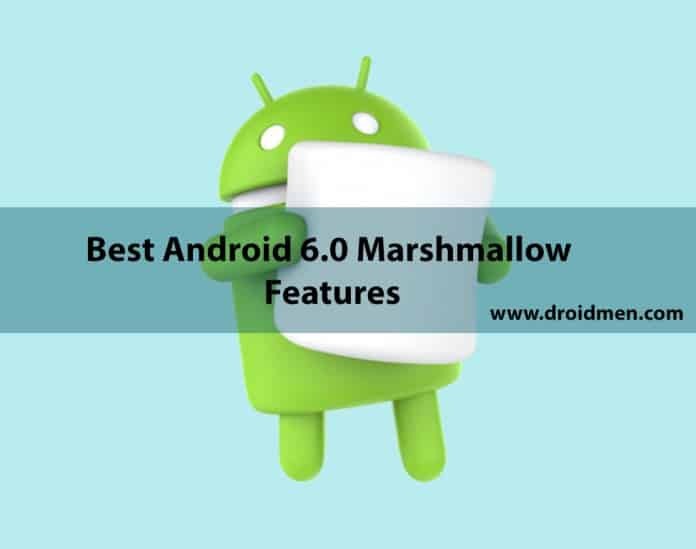 In this post, Below we will be sharing some best Android 6.0 Marshmallow features, some features might not be known to you and some might be well known to you. This is a very vital part of any app. In any previous version of Android, while downloading an app there comes a pop-up which shows which corners of the phone will be accessed by the app. We have always granted permission without even going through the details properly. Do you realize how vulnerable you make your details? Even though you have always overlooked such a vital detail, Google has been very thoughtful to come up with the ‘App permission’ in Android 6.0 Marshmallow. Now the apps will take your permission before accessing any phone features like camera, contacts, etc. If you refuse to grant permission, then you can very easily continue using the app without any problem. Right from my early teen, I have always been advised to ‘Google’ for any answer. This feature let’s you an in-depth knowledge of anything that your are currently doing on your Android. Let’s say you have some app running and can’t make out the exact usage of the app, hold the home button for a while. You will be redirected to Google for more valuable information. Battery has always been an issue in our phone. No amount of mAh can satisfy our growling appetite for battery. So this feature will surely brighten you up. Whenever the phone senses that phone is no longer in use, it puts itself in Sleep Mode to save your battery. This was a feature that was talked about by Marques Brownlee in his video ‘Top 5 Android Marshmallow feature’. Check out the video here. Chrome custom tabs allow you to use Google Chrome in between an other app. Let’s say some app requires Sign In to Google. So it’s pretty much a headache to exit the app and Sign In and again re-open the app. This feature allows you to run the Chrome run on top of the app, the Chrome adjusts its color according to give you the feel of using the app properly. Many leading manufacturing companies have launched this feature quite sometime ago. But this time Android bring to you the Fingerprint Support with the Android 6.0 Marshmallow. This features makes use of the sensors in a better way, meanwhile the user can do everything it used to do with fingerprint support like unlocking the device, making transactions on Play Store, etc. You must be pretty used to getting all your contacts and files to your new Android the moment you Sign In with your Gmail ID. Now get used to getting your App data and Settings back as well. All these processes gets carried out when the device is in idle and the Wi-Fi is connected. So in case you lose your Android phone, by signing in via your Google account on your new device you can get the details of all the WhatsApp messages, or another app data. These were the Best Android 6.0 Marshmallow features according to us. Is any of your favorite missing? Let us know in the comments below, BTW which one is your favourite Android 6.0 Marshmallow feature?